There's nothing quite like going home for a few days, which is just what I did last week. A chance to recharge the batteries, and be looked after - everyone needs that every now and again! My mum has two five month old kittens called Treacle and Sponge. They are utterly adorable, and if I lived somewhere appropriate for cats I'd steal Sponge as he is great. As I've only seen them a handful of times, each time I do see them, they appear to have grown an awful lot! 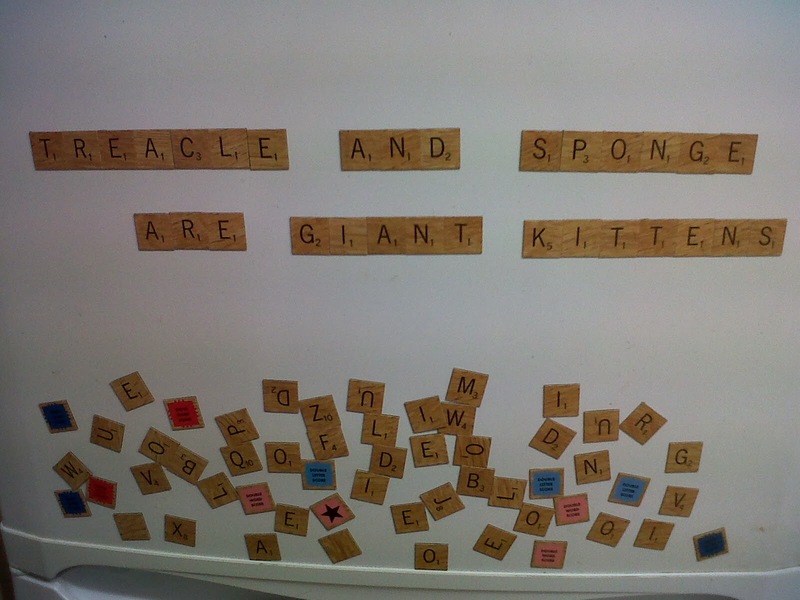 This magnetic Scrabble set on the fridge summed up their growth perfectly. On the Friday night Mum and I went to see Sarah Millican's Home Bird tour. We booked the tickets almost 18 months ago, so it's been a long wait (apparently people have been turning up at venues a year early!). It was a really good show, very very rude, but great fun. She gives away badges at each of her shows: for this tour they either said 'home bird' or 'dirty stop out'. I also got a mug, I do love mugs. No, I don't have enough mugs. Yes, I do need another mug tree. No, that does not mean I have enough mugs. For lunch on Saturday Mum and I headed to one of my favourite Cambridge places, The Orchard Tea Garden. It's a lovely little place in Grantchester which in the summer is the perfect venue for afternoon tea. 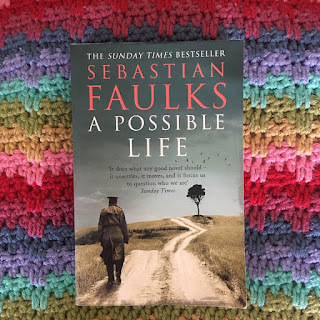 It has a lot of history surrounding the poet Rupert Brooke, and I have many happy memories from my childhood of cycling to Granchester in the summer with my dad and brother and having a drink and a slice of cake. It's definitely more beautiful in the summer, Mum and I had to walk down a rather muddy path to reach the pavilion, but it is still a lovely place to visit. Some people were sitting outside on the deckchairs (wrapped up against the wind) but we weren't going to do that! 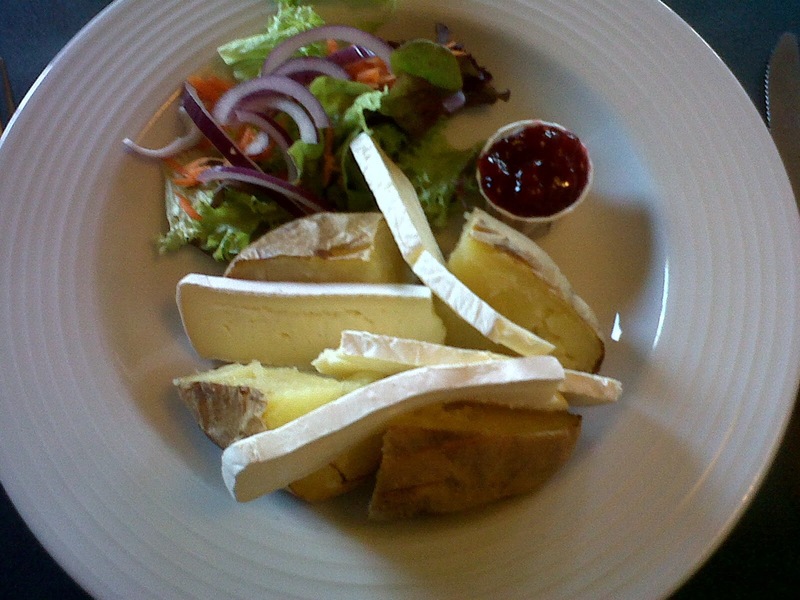 There's a good lunch menu, we both had baked potatoes, mine with brie and cranberry and Mum's with roasted vegetables, followed by a large slice of cake each. Then a walk back up the muddy path to return to the car. Must do my best to return to The Orchard in the summer for a proper cream tea. When I go home, I always make sure my suitcase is only half full, as inevitably I leave with much more than I went with! This trip I brought back several books and a bottle of homemade sloe gin. I also brought back the knitted sock I'd started at Christmas and Mum had finished off, as I had, erm, gone wrong (counting is hard!). I have since finished the second sock, I have mastered the art of counting. Photos to follow!